Paper may include anything flat and paper: postcards, cards, handmade paper, craft paper, scrapbook pages, textured paper, ATC backs, origami paper, envelopes, illustration/bristol board, ATC's, ephemera, sticker pages, stamps, text, music, etc. Artists can even included paper that's been painted or collaged on. Please include a diversity (3+) of paper types and sizes. Paper may not include: very crinkled/wrinkled paper (folded paper ok), cardboard, canvas, ribbons, or fabrics. Stuff the box to capacity with paper items, include a note to your swap partner, and feel free to toss in a just a few miscellaneous goodies for your fellow paper lover. The majority of your box should be paper, paper, paper items. 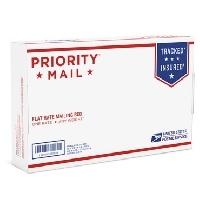 The US Small Flat Rate Dimensions are 8 11/16" x 5 7/16" x 1 3/4" The postage cost is $7.20, no matter the weight. The boxes are free at the post office. My postal worker advised that I not use the decorative duct tape on the outside of my box because it clogs the machines. If you use it, please cover with clear packing tape. Hi would love to join this. Can you maybe change the deadline so it isn’t on a Sunday. Would hate for someone to wait till the last day and not realize the post office isn’t open, thanks!